Bring your camping skills up a notch with these easy-to-use camping tips. 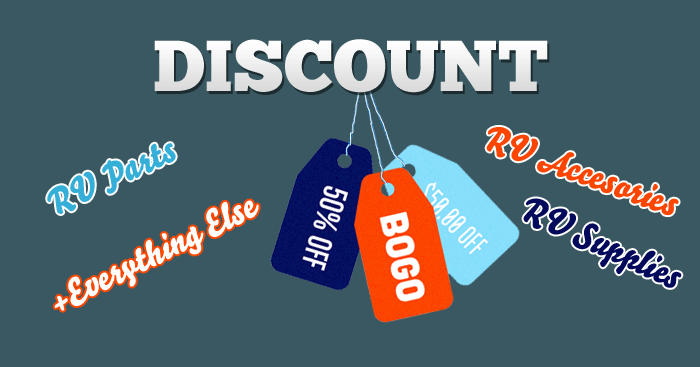 Whether you’re a seasoned campground hand or a newbie, there is one currency that will quickly make you popular among campers of every variety. 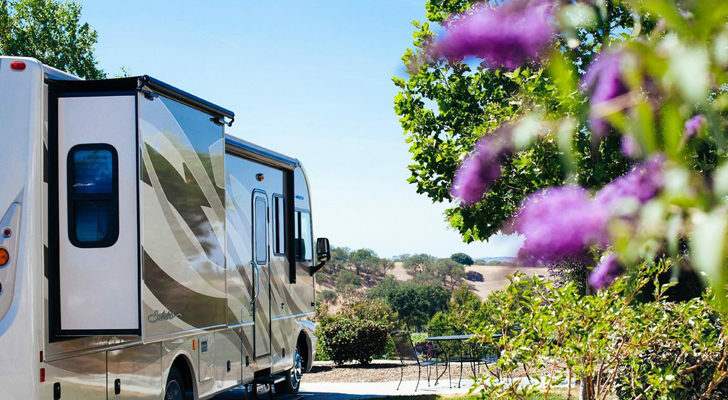 From pup tent granola crunchers to luxury RVers, if you know tips and hacks that really work to make life on the road easier and more comfortable, your place around the campfires and picnic tables of the world is assured. So, where does one find such incredible tips? Here are ten that will make you the Einstein of outdoor living. 1. 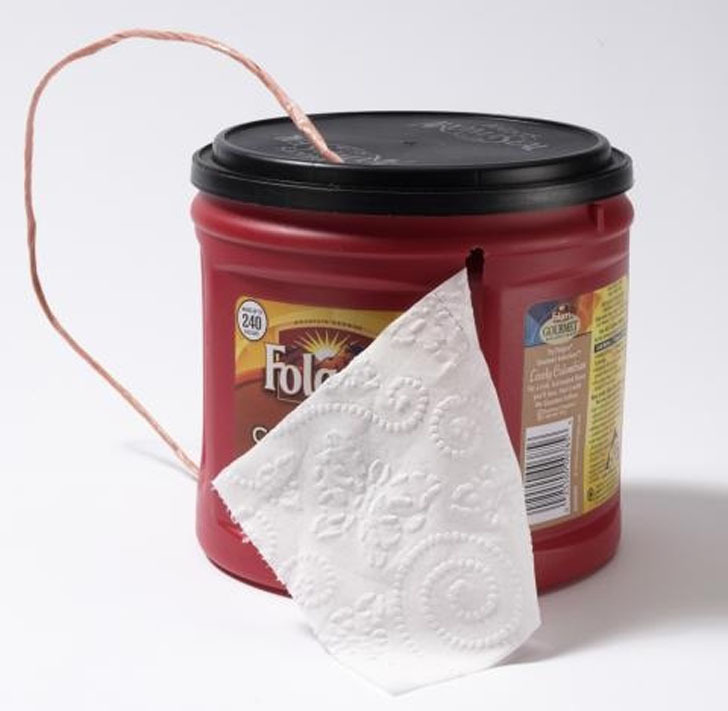 Use a modified coffee can as a handy TP holder. 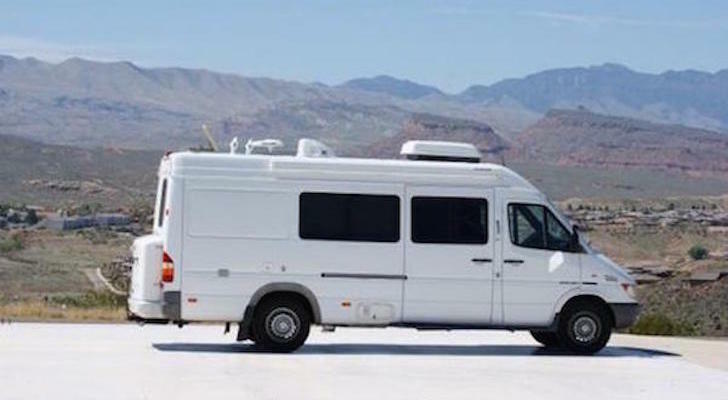 Even if you ride the roads in the ultimate luxury sixty foot motorcoach, you may occasionally run into a situation where you will need to use the little boys or girls room in a rest stop, campground, or truck stop. Empty a plastic coffee container with a removable snap-on lid. Cut a slot in the side for the paper to run through. Poke a hole through the bottom and another through the lid. Fit your paper in the can and run a string through the bottom and top holes and the center of the roll. 2. 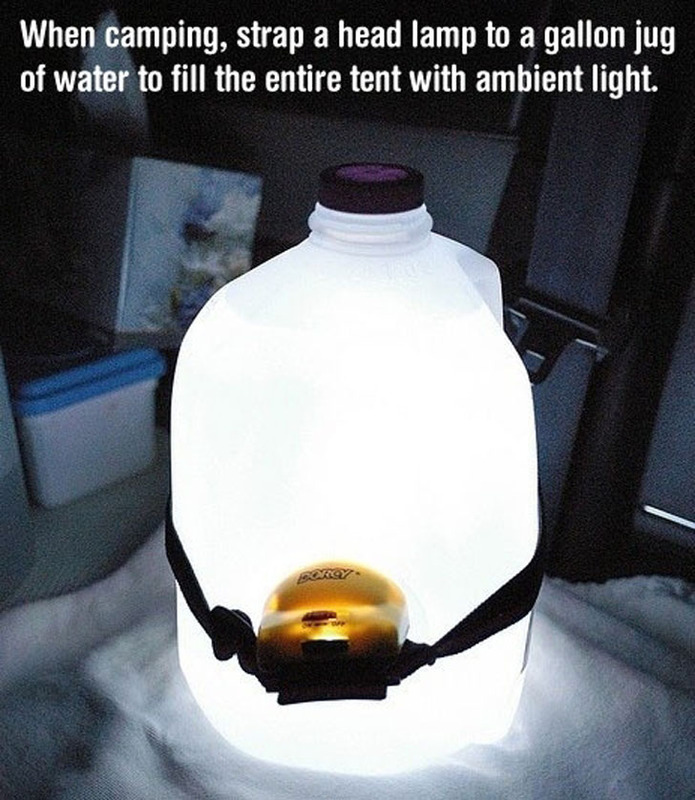 Turn an empty water jug and headlamp into a portable lantern. LED headlamps are one of the most brilliant advances of the twenty-first century. 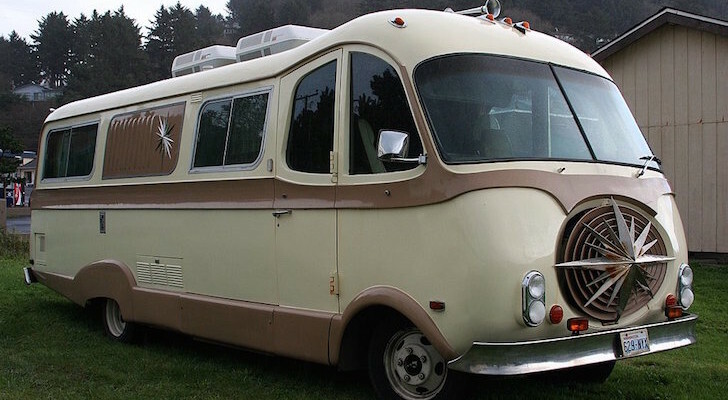 You likely don’t know what I mean unless you have used one to get your RV back on the road. 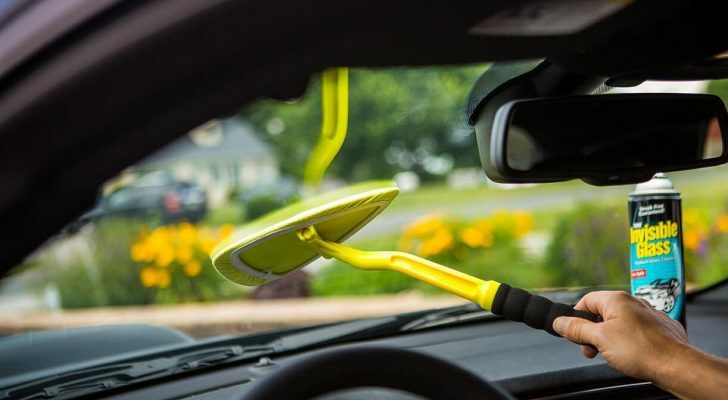 Every camper or RVer should have several. They are cheap, make batteries last forever, and are superior in every way to flashlights. Couple one with a milk jug full of water and tada! Now you have a table lantern. 3. Store spices in empty Tic Tac dispensers. Whatever kitchen supplies you may do without, never leave the spices at home. The right spices can turn ho-hum to magic. While spice containers are not typically a huge hassle to travel with, the conditions of camping tend to be hard on your spices, from containers being damaged or left behind, to humidity causing spices to clump. 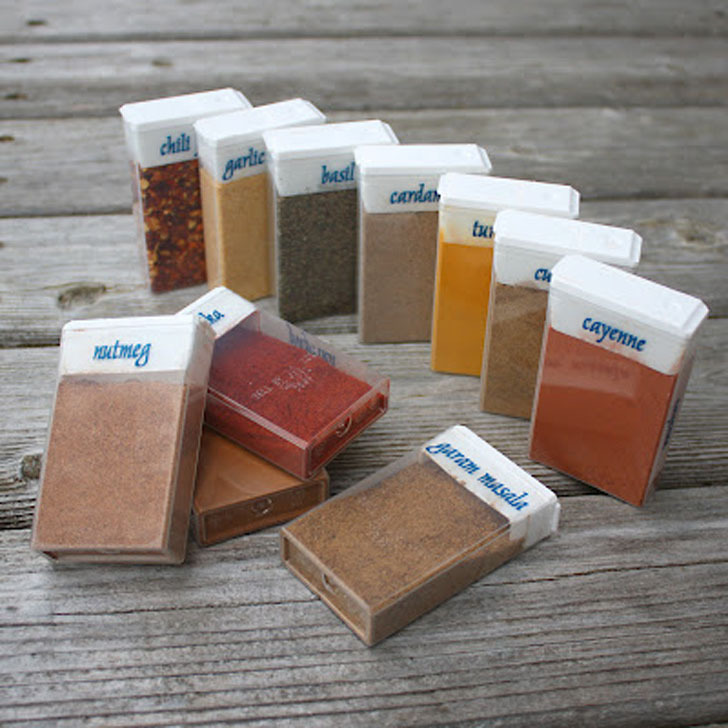 Use empty Tic Tac boxes to store your spices in small, disposable samples that won’t matter if they disappear or clump up. 4. Make yourself at home with comfortable seating. 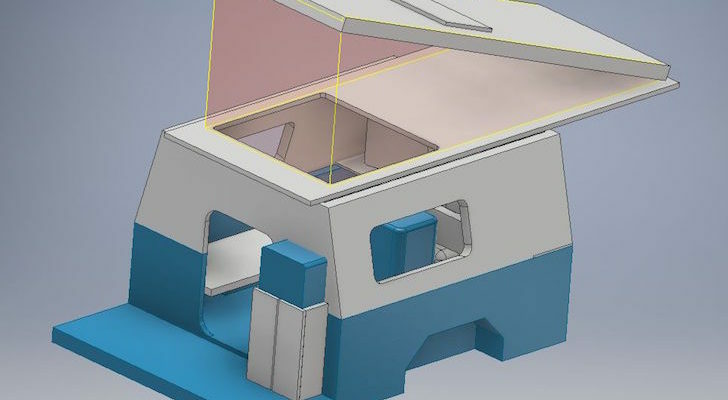 Especially for car or van campers, having outdoor sitting and living areas is essential. 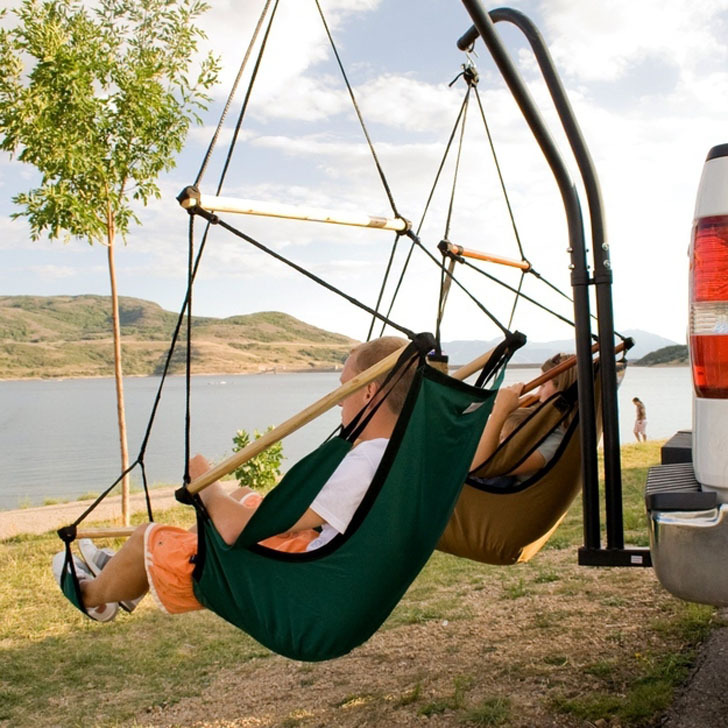 This great pair of hammock chairs fit into your vehicle’s trailer hitch receiver. Why does this matter? 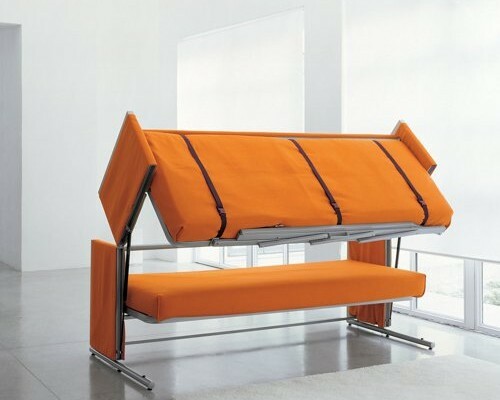 The strength required for a hammock chair’s support would require a bulky, heavy frame. 5. Create festive outdoor lighting with candles. Lanterns and tiki torches are great for outdoor lighting, but this is a fun method for inexpensive, decorative lighting that is also easy to store and transport. Start with tapered candles – they can be purchased several for a dollar at the nearest dollar store – and a ¼ inch drill bit. Drill a hole in the bottom of each candle and insert a ¼ inch dowel holder. 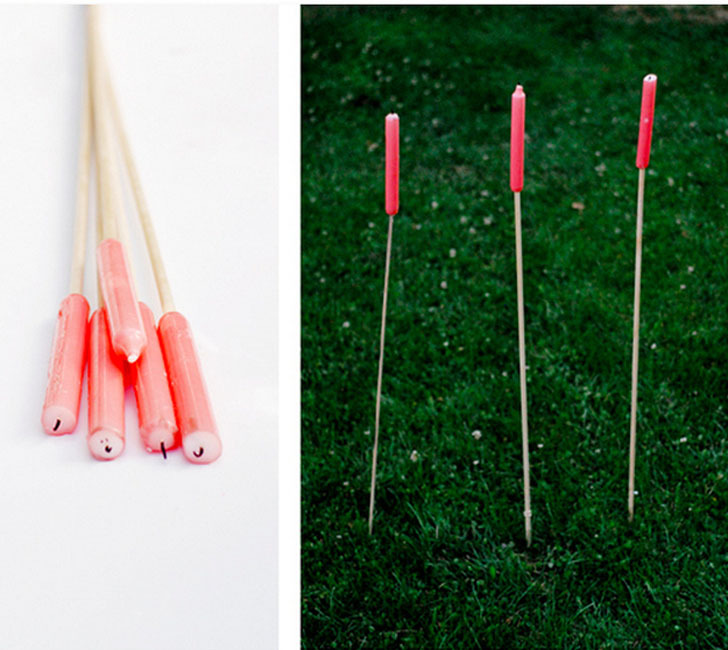 Poke your dowels into the ground around the area you want to light and light your candles! 6. 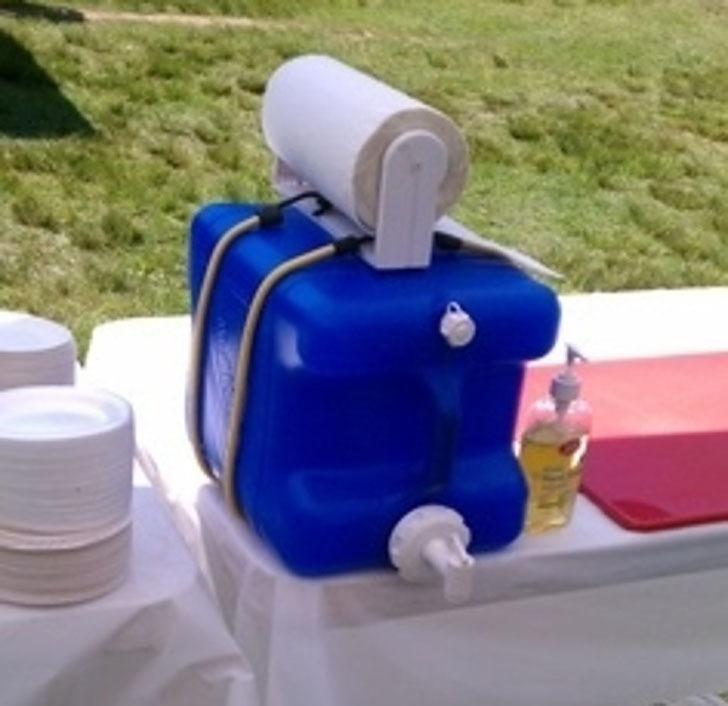 Turn a juice jug into a portable hygiene station. You’ve just finished dinner. It’s time eat and if you’re being honest, the kids probably need a shower, but you’ll accept washed hands and faces at the outdoor table. Rather than send them parading through your clean RV to the bathroom, set up this hand-washing station. Use a large empty detergent bottle with a spigot, and bungee cord a plastic paper towel holder on top. Add a pump bottle of hand soap and clean hands can be had in the out-of-doors with no hassle. 7. Wash your clothes in this dirt cheap bucket rig. While electric washing machines may seem like rocket science or voodoo, what they essentially do is swish clothes through warm, soapy water. 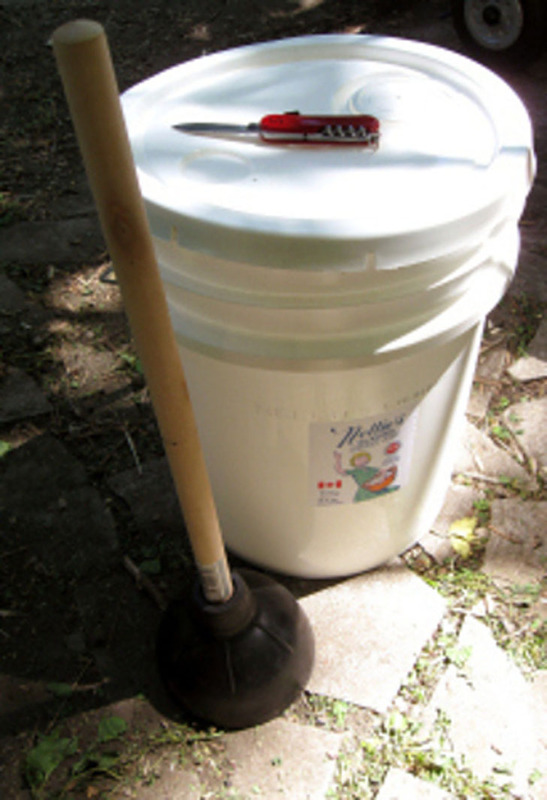 Cut a few holes in a cheap plunger, pop the top out of a five gallon paint bucket lid for the plunger handle, run it through, fill the bucket with warm soapy water, and see how long your kids can keep the machine running! To rinse, pour out your wash water and fill with clear water. 8. 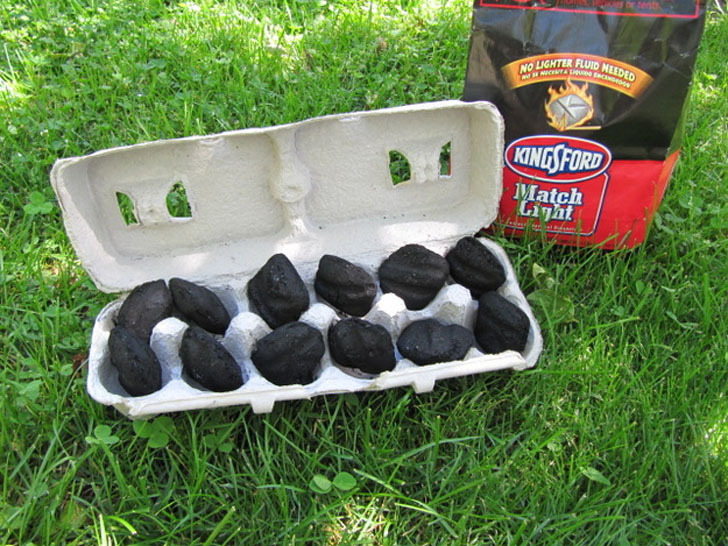 Use an egg carton and some charcoal for an “egg-stra special” fire starter. This is a great way to get your campfire (or even charcoal grill) lit without using hazardous lighter fluid. Purchase match ready charcoal – which has lighter fluid added to the formula for the briquettes. Place six or eight chunks of it in a cardboard egg carton and light a corner with a match! 9. Make your own cooler ice blocks. The blue ice packs last longer, get colder and are very convenient. Still, here’s a home made method that is cheaper, and as an added bonus, once thawed they can be used for drinking water. 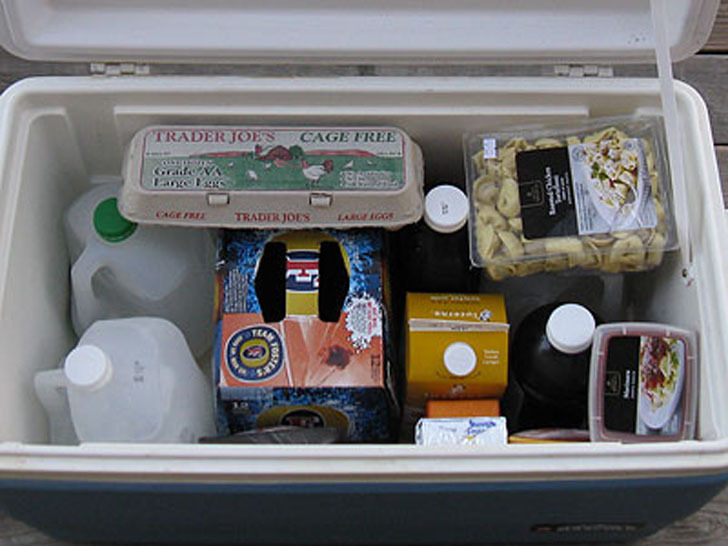 Simply fill empty mik cartons with clear water and place them in the freezer. They can be refrozen once thawed, or opened and emptied for water. 10. 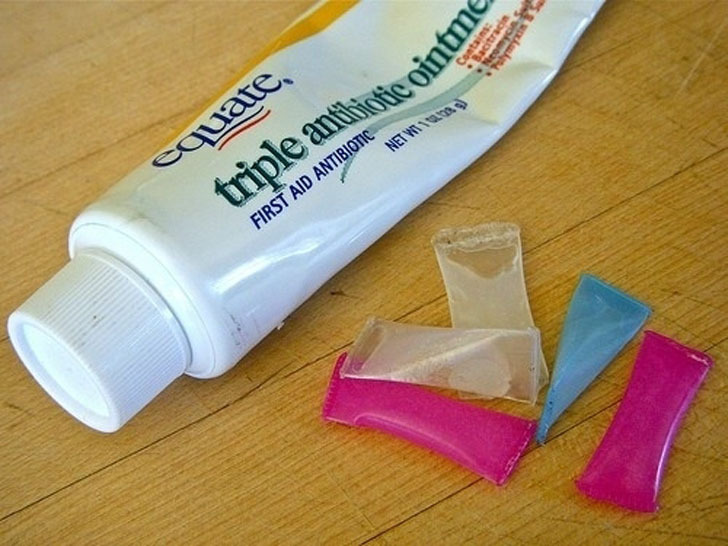 Turn soda straws into single serving toothpaste packs. 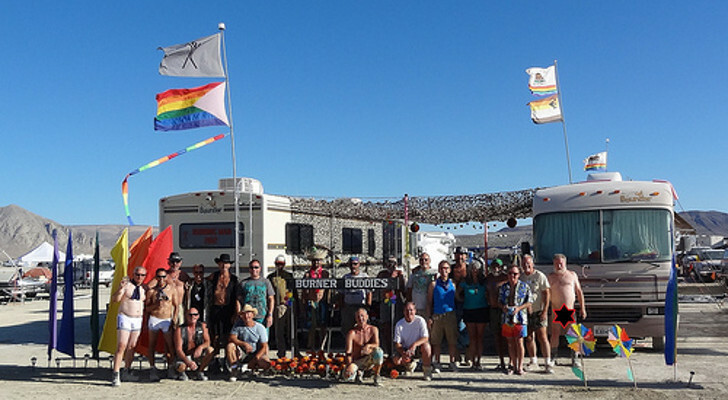 Space is always limited on camping trips and messes are unwelcome. Crowded spaces, chaos and things like toothpaste don’t mix well. To prevent your having to spend time cleaning up after the morning hygiene regimen, use sections of drinking straws to contain single uses of messy products. Clamp one end with needle nose pliers, heat with a lighter to seal, cut to length, fill with your choice of products and seal the other end in the same way. Works great for salt, pepper and spices as well.